I’ve warned you to avoid the stores, so for the next two days, I’m going to share with you some DIY gifts. Today’s subject is crafts, but unless you have a craft closet like yours truly, you may need to go to a craft store. Here are some easy things that you can make at home! · Stockings: $1 stockings + glue + glitter, you’ve made personalized stockings! · Limoncello: Ferment a quick gift! Bottle it in mason jars. 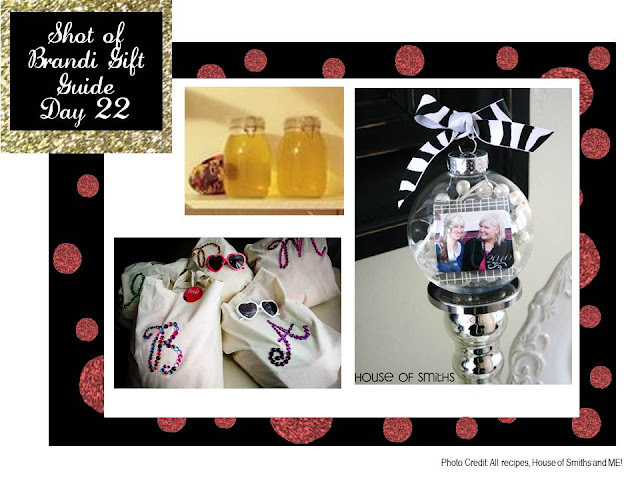 · Ornaments: There are so many things you can do with inexpensive clear ornaments. I like this photo ornament from the House of Smiths blog (no relation!). I’ve also seen clear ornaments with a variety of things inside like pearls, sequins, glitter and candy! Get creative! · Tote Bag: I made this tote for my bridesmaids! It’s super easy – buy a canvas tote, outline an initial and then bedazzle the crap out of it. Whola!